It has been months since I made this cake but it was a recipe that I really wanted to blog about. For one, it tastes fan-freaking-tastic and I don't even like chocolate cake. But, more importantly, making this cake reminded me of the all the reasons why I enjoy baking, most specifically, the ability to trigger a taste-memory or feeling of nostalgia for the recipient. On a crisp, chilly Sunday morning, while eating breakfast with my boyfriend's mom and dad, I learned that his dad had a birthday fast approaching. For my gift to him I offered to make him any dessert he wanted. At first he politely declined but in almost the same breath he changed his tune. "You know," he said, his eyes grew wide, "there is actually this one cake my mother used to make. I haven't had it in decades, but I remember it was chocolate and it was made with..." and he paused, "...it was made with MAYONNAISE!" Without missing a beat (or even a hint of a wince), I flashed him a dimpled smile and said, "I can make that! What flavor frosting?" He looked like a little boy in that moment, with his blue eyes glistening and a smile so big, his entire face lit up. "Chocolate cake with chocolate frosting! That's just how she made it," he announced, proudly. I was so caught up in his genuine excitement, I actually clapped aloud. On the day of his birthday, my boyfriend treated him to lunch and, since I wasn't able to go, he brought the cake with him. Later that evening I got the sweetest text message from his dad. Unfortunately I don't have it verbatim but it was something along the lines of, "...Your cake created a bit of a space time continuum! For a few minutes today I felt like a little boy sitting at my mom's kitchen table. It was wonderful! Thank you so much!..." My heart swelled a little in that moment. Mission accomplished. Preheat oven to 350F. Butter and flour three 8-inch-diameter cake pans with 1 1/2-inch-high sides. Combine chopped chocolate and cocoa powder in medium metal bowl. Add 1 3/4 cups boiling water and whisk until chocolate is melted and mixture is smooth. Set aside. Sift flour, baking soda, and baking powder into another medium bowl. Set aside. Using electric mixer, beat both sugars and mayonnaise in large bowl until well blended, 2 to 3 minutes. Add eggs 1 at a time, beating until well blended after each addition - about a minute each. Beat in vanilla. Add flour mixture in 4 additions alternately with chocolate mixture in 3 additions, beating until blended after each addition and occasionally scraping down sides of bowl and the beater. Divide batter among prepared cake pans (about 2 1/3 cups for each). Bake cakes until tester inserted into center comes out clean, 30 to 32 minutes. Cool cakes in pans on racks 20 minutes. Run small knife around sides of cakes to loosen. Carefully invert cakes onto racks and let cool completely. Wrap in plastic and store in the refrigerator for at least 2 hours or until the cake is totally chilled. I would strongly encourage you to store it at least 24 hours though. This helps the flavor to become more developed and makes the cake easier to frost. Place chopped chocolate in medium metal bowl. Set bowl over saucepan of simmering water (NOT boiling!) and stir until chocolate is melted and smooth. Carefully remove bowl from over water and let melted chocolate cool until lukewarm, stirring occasionally. Using electric mixer, beat butter in large bowl until smooth and creamy. Sift powdered sugar over butter and beat until well blended, about 2 minutes. Beat in vanilla. Add melted chocolate and beat until well blended and smooth, occasionally scraping down sides of bowl and the beater. Place 1 cake layer on platter. Spread 3/4 cup frosting over top of cake layer to edges. Top with second cake layer; spread 3/4 cup frosting over. Top with third cake layer. Spread remaining frosting decoratively over top and sides of cake. Cover with cake dome and let stand at room temperature at least an hour before serving. You're so right. It's moments like that that make baking the fun that it is. That cake looks awesome. I've been making this for years it's truly one of my favorites. I think I remember reading that they baked cakes with mayo in them during WW2 in hopes to ration the butter and eggs. I'm quite curious to try this recipe. How wonderful, that you could do that for someone...you'll never get a better compliment. Oh, and the cake looks delicious! What an adorable story! I've heard of mayonnaise cakes before, but I've never tried one... did you taste yours? Was it delicious? Baked the cake last night..sitting in the fridge till after work so i can do the frosting.... I didnt have enough baking tins so i baked each layer on its own.. I will frost it tonight but intend to serve it tommorow..Once frosted, can it leave it another 24 hrs at room temp or should i leave it in the fridge? Thanks for sharing a great recipe of chocolate cake. I am a great lover of chocolate cake so i will make this today. I used to hate the thought of baking with mayonnaise, but ever since i've eaten a piece of chocolate cake that was baked with mayonaise, well, im a believer :). Definitely going to bake this one. Thanks for sharing the recipe. Your comments really make my day. Thank you so much for taking the time to leave one! I'm Julia and welcome to my little dessert blog! For me, baking is my refuge, a creative outlet and a way for me to learn more about food. I am so glad you stopped by! 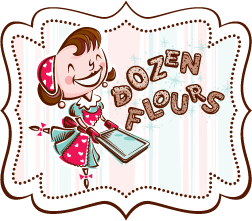 © Dozen Flours, All Rights Reserved.